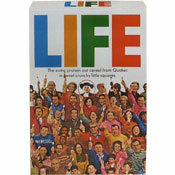 Overall, I liked this cereal. The flavor reminded me of basic trail mix, a combination of nuts and seeds you might take hiking or camping. The honey-sweetened flakes are a bit like over-sized Wheaties flakes with a more complex texture. They taste like a dozen other whole grain flakes on the market. Nothing new or different, they're just doing their job. It's the sunflower seed-infused clusters that make this cereal unique. Usually, clusters offer a sweet distraction from the more prominent cereal pieces. In this cereal, the clusters offer up a nutty, healthy flavor that makes the flakes seem sweeter by comparison. I'm on a healthy eating kick lately and I liked the earthy flavors of the pumpkin and sunflower seeds. However, what I found to be earthy and granola-like came across as "boring and kinda musty" to another person in the office. If you're a person who likes trail mix with nuts and seeds, you'll probably be into this cereal. If you like chocolate chips and yogurt covered raisins in your granola and trail mix, you're likely to find this cereal bland. Nutritional Considerations: Each 1 cup serving has 220 calories, 5 grams total fat (0.5 saturated and 0 trans), 37 grams total carbs, 6 grams dietary fiber, 8 grams sugar and 8 grams protein. 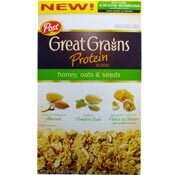 What do you think of Great Grains Protein Blend? I've only had the Cinnamon Hazelnut Protein Blend and it's phenomenal. And it tastes great! I tried the Cinnamon Hazelnut Protein Blend. I enjoyed it. I know that cinnamon is another metabolism booster, but I had been worried that it would be overpowering, however it was not. I added a few walnuts. I will get it again. It was very enjoyable. I like it a lot, but unfortunately I can't seem to find it at many of my local stores. So far, Target has been the only one carrying it by me.